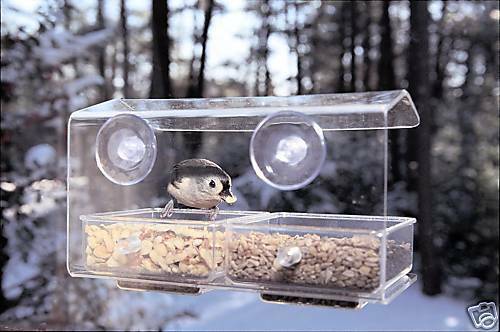 "Window Double Seed Tray Buffet Birdfeeder" Aspects' Window Feeders satisfy most customers' primary demands- they bring birds to within inches of curious viewers, and they are the easiest of any feeders to clean. The strength of this suction cup mounting system surprises even veteran birders, while providing hours of enjoyment. Measures 4.75" x 8.25" x 5" **Usually ships within 24 hours of payment. PLEASE NOTE: Shipping ONLY within the continental U.S. Hawaii, Alaska, and Puerto Rico must contact seller for shipping quote before ordering.